Great house, gorgeous location! Nestled in the foothills of the Blue Ridge mountains, near historic Shelby and Kings Mountain, NC. We have 5 acres of rolling hills and hardwood forest, directly on 400' of waterfront. Plenty of space to let the kids and pets run around! Only 45 minutes from Charlotte, but worlds away from the hustle and bustle. 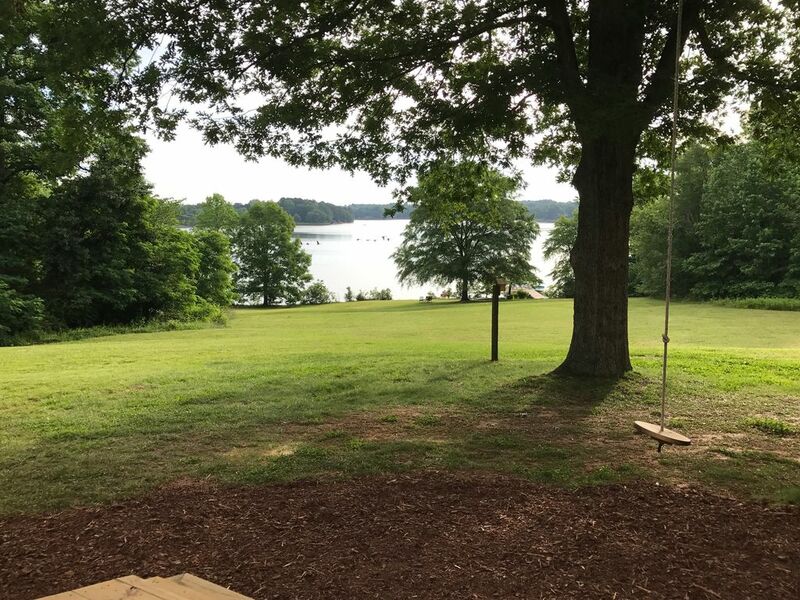 Moss Lake is a quiet, spring-fed lake that is very clean (it’s the primary water supply for Kings Mountain) where you can canoe, fish, water ski and jet ski without the mayhem of other lakes near Charlotte. Close to Kings Mountain, Historic Shelby, Crowders Mountain, Schiele Museum, golf courses AND other attractions - there is plenty to do if you want to get out and about. The waterfront includes a large private dock with mooring cleats, only a few minutes from a public landing so getting your boat there is a breeze! With state-record bass, it’s perfect for early morning anglers; with stunning views, it’s perfect for a sunset canoe ride. Or, kick into high gear with your jet ski or power boat. Whatever your pleasure, you’ll enjoy your water sports away from the crowds for a relaxing and fun experience. On the property is a charming farmhouse with two bedrooms and one full bath and one half bath specifically set up for accommodating and entertaining large groups (owners have 5 kids, who all bring their friends for overnight sleep-overs!) With a queen-sized bed in the master bedroom, two sets of bunk beds in the other bedroom, as well as a pullout sofa in the great room - which all mean you can sleep up to 8 comfortably. Includes newly renovated modern kitchen and bathroom, washer/dryer, new water heater, A/C, etc. HDTV with DVD player, free WiFi, and a bunch of popular movies for your use. We even have a closet full of books, puzzles and board games if the kids ever wear out from all the fun in the sun. This is truly a 'hidden gem' we are renting out again this year - discover it, and love it like we do! We are a family with 5 active kids and an energetic border collie. We use the lakehouse whenever we can - but enjoy sharing it with other folks. Golf course 10 minutes away - very nice course, only $35/round includes cart! This has been my families favorite rental to date. Clean, updated with lots of privacy. Only about 50 minutes from Charlotte and 1 1/2 hours to Asheville, we had plenty to explore. Great little restaurants in Shelby. The property was spectacular with multiple large decks and a huge dock. The use of the canoe and sailboat are included with the rental. We would definitely rent again, and if we lived closer we would rent for weekends during the summer months. Wonderful place to relax and enjoy nature. Home is equipped with all you need and more. Our family spent the weekend at this lake home and thoroughly enjoyed our stay. The lake was beautiful and quiet. The pier was a perfect spot to fish and relax. The home was very comfortable with everything we needed. The kitchen was well stocked with dinnerware and appliances and we had everything needed to cook and enjoy family-time. The owners were very prompt to answer questions and were very easy to work with. If you are looking for a quiet family retreat, this home is the perfect spot. We loved this place and will definitely return. The house is in off the road so it's quiet. The lake was very, very enjoyable, even at night there was a wonderful breeze. The swing in the yard is an added touch for these two 45+ year olds! Cooking is a breeze in the updated kitchen and there is literally everything you could possibly need in this house. We'll be back! This was our second year in a row staying here, we had so much fun hanging by the lake, making smoores in the fire pit, and waking up to a beautiful view of the water. I hope we are able to go it again next year and making this an annual tradition. Relaxing with a capitol R.
Relaxing home. Relaxing view. Wonderful dock for swimming and fishing. Love this place! Near Kings Mountain and Shelby, right on Moss Lake!!! Large private dock, gradual beachfront, perfect for kids.